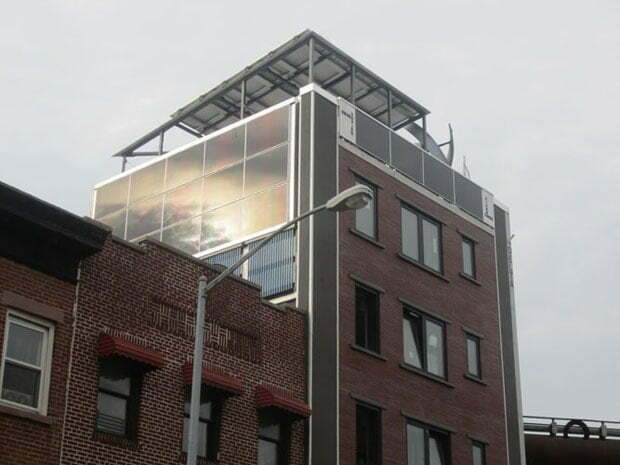 For Immediate Release—May 29, 2012—Binghamton, New York–SunMaxx Solar, a leading, vertically integrated manufacturer of solar thermal systems and components, is pleased to announce the installation of a solar thermal system at The Delta House in Brooklyn, New York. The install, which was designed by Green developer Voltaic Solaire, is the first mixed-use private development in New York City to combine solar and wind energy, meeting 100% of The Delta’s energy needs—generating its own electricity, hot water and heat. The Solar Thermal Panels gracing the exterior of The Delta, that provides beautiful form as well as solar thermal function, were designed by SunMaxx Solar. On Wednesday, June 13, 2012 members of the New York City media are invited to tour the building between 4pm-7pm , located at 142 W. 9th St., Brooklyn, NY 11231. The Delta is on the forefront of a movement that is long overdue in New York and other dense urban areas, and is a tribute to Voltaic Solaire’s valuable partners and suppliers such as SunMaxx Solar, without whom this type of forward-looking real estate development would not be feasible. From the SunMaxx solar panels to the aggregate building materials to the innovative window treatments, the Delta is a case study in sustainability and energy independence. The triplex residence with attached restaurant and retail will be maintained as a bed and breakfast in order to facilitate ongoing green sustainability educational visits for schools and tour groups. SunMaxx Solar will continue to develop and help procure the installation of solar thermal systems at residential estates across the nation, and is proud that the company’s installations greatly contribute to reducing the nation’s carbon footprint. In today’s energy consuming world, SunMaxx offers world-class solar energy and renewable products, striving to meet the increasing need for alternative energy sources.